Nicky in an Oscar de la Renta confection lounging on her sofa, which is covered in a Colefax and Fowler windowpane check. The custom colored de Gournay Plum Blossom is staggeringly beautiful. A wider shot. I am in love with this room. First, there's the red, white, and blue palette and the use of very traditional and old school elements. They appear to use a variety of shades and saturations of blue and other charming accents, like the seemingly random green and blue lamp, which makes a beautiful composition of "not trying for perfection" that immediately lends both ease and refinement. Then, there is the furniture layout. This is my favorite layout for a salon - whether more formal or casual. It makes for extremely comfortable conversation and enjoyable visiting. The center ottoman allows everyone to put their feet up - because even (if not often) when we are wearing ball gowns, we still want to put our feet up. I am working on two different projects in which we are using this same layout. It just works. 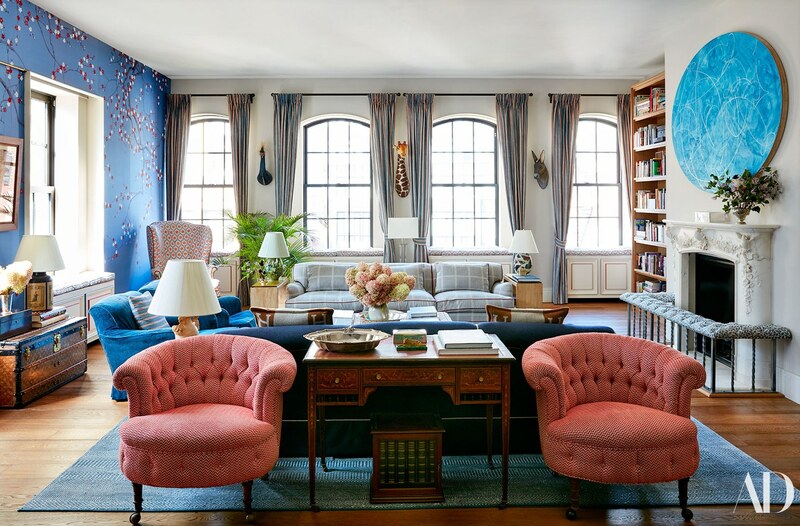 The apartment is repleat with heirlooms and antiques, including the tufted chairs and table in the foreground, the antique Louis Vuitton steamer trunk, and the taxidermy among the fenestration. You can see from this angle that the decor has a very light touch. It's Americana and Britannica but with a deft hand. Nicky really reached out and grabbed me when I saw this picture and it's not because her baby Lily Grace is so stinking cute. It's her Elliott Puckette. I have been obsessed with Elliott Puckette for almost 15 years now. One day . . . one day I hope to be so lucky. The fireplace mantel is a family heirloom. Okay. Are you dying??? This is when the red, white and blue thing really, really hit its stride. 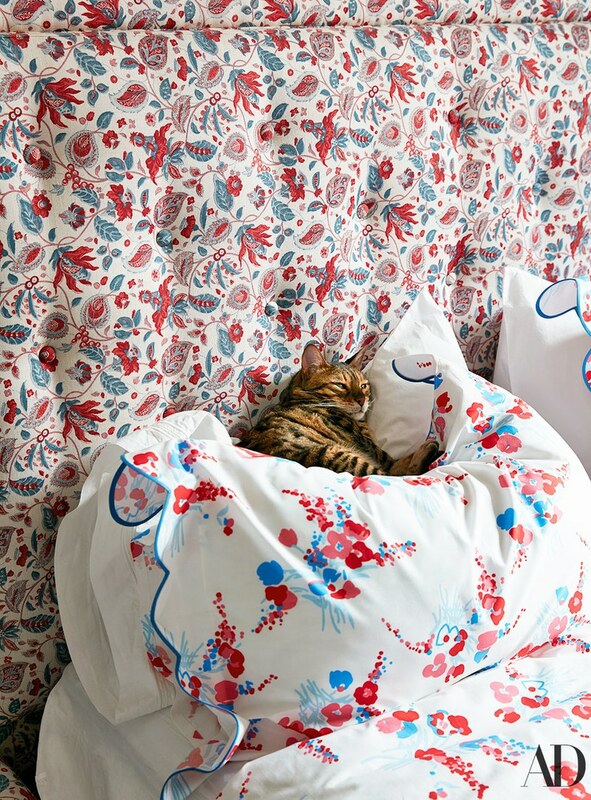 I am a fool for two things (well, at least two): (1) bedrooms done à la française (where the same fabric covers all soft surfaces in a room); and (2) Porthault floral bedding. The Bennison fabric on the tufted headboard and walls is perfection and the competing Desmoiselles Red/Blue Porthault sheets literally sends my heart into the stratosphere! Lily Grace's nursery. The wallpaper is Stellae in Snow on Sky by Peter Fasano. 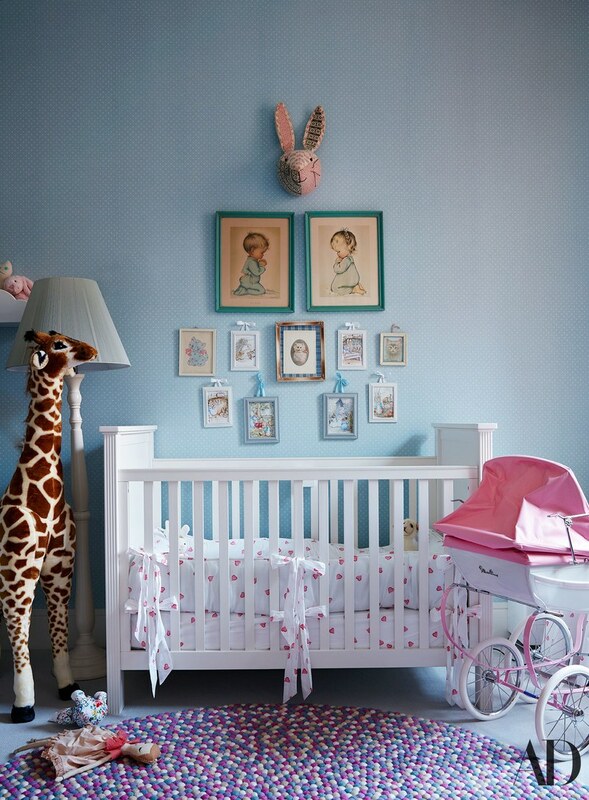 I mean, how genius is it that they soften the red, white, and blue to baby blue and pink in the nursery? And, again, with the Porthault bedding. There is nothing more truly perfect than Coeurs Pink for a baby girl's crib. Word. The red library is lined with racing memorabilia from James' dad and it is totally fabulous. You just don't get many red rooms these days. Certainly, it was huge for the Brooke Astor generation, which was before my time. However, in my lifetime, I recall a moment when the red dining room was still de rigeur for all true Jackie Kennedy Onassis devotées. 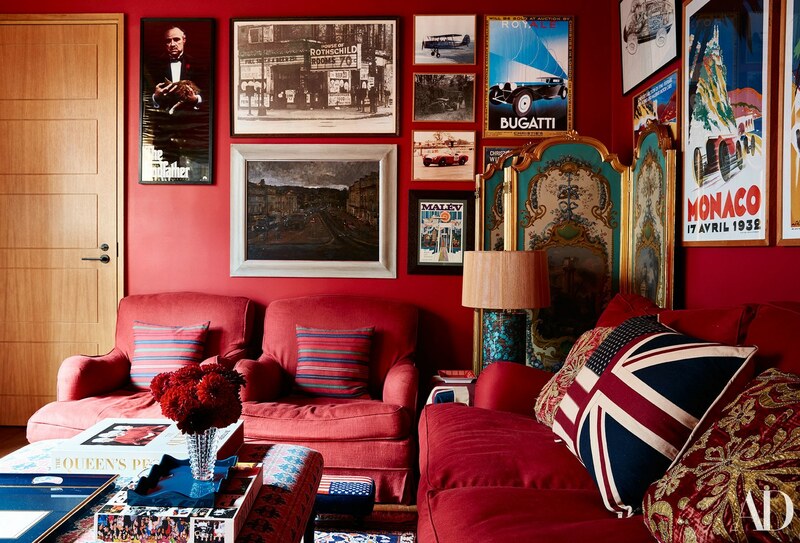 That trend seemed to be extinguished by the late '80's/early '90s and we haven't really seen much of a red room ever since (except for one or two by Miles Redd). So glad to see that it might be making a come back. 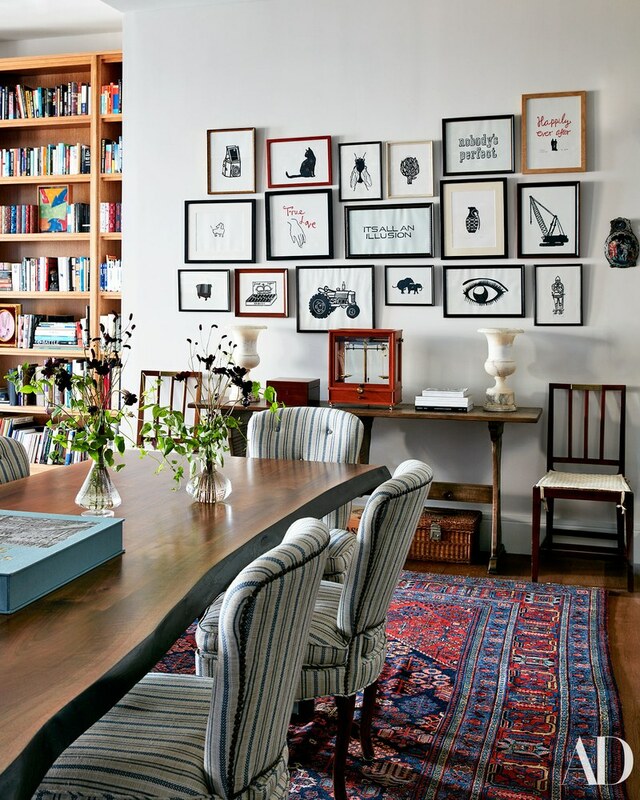 Prints by Hugo Guiness, James' uncle and Elliott Puckette's husband, line the far wall of the dining room and open kitchen. Family heirloom pieces include the two chairs flanking the console, which were from the coronation of King Edward VII. It's wonderful to see them comprised in a room that also includes a very modern dining table. Nicky and James on their wedding day. Nicky's fabulous dress is by Valentino and was designed during the period when both Maria Grazia Chiuri and Pierpaolo Piccioli were at the helm. While it may be sacrilege to say it, I kind of like her dress better than Kate's. I know. It's scandalous to say it. Very reminiscent of the same photo of Kate and Pippa when Pippa was adjusting Cate' dress and veil just before she entered Westminster Abbey. Nicky has literally been shutting it down left and right at every event she has attended whilst pregnant. This is pregnant perfection. And, so is this. I mean, L.O.V.E.!!! So, let's just put the cards on the table. When you are dealing with the Hiltons of Hollywood, really, you could expect the interiors to break either way, right? But, from what we have seen of Paris's younger sister, Nicky, in the years since she wed James Rothschild, of the European banking dynasty Rothschilds, we could safely assume any house she and James put together would be spit-spot and smashing. (Let's recall her fabulous Grace Kelly-esque Valentino wedding dress and their amazing wedding photos). In fact, I kind of expected when I read the by-line on AD "Go Inside James and Nicky Hilton's Manhattan Apartment" that the ensuing suite with be nothing short of fabulous. And, I wasn't disappointed. See the full story here. James took the lead on decorating, masterfully bringing in family heirlooms and furniture from his family's estate in Europe, and re-upholstering them to freshen them up. It is no wonder, then, that the whole apartment reads steeped in tradition, but fresh. Nicky says she added some feminine touches, accessories, and insisted that the house be family friendly - recalling a childhood in a home full of rooms and furniture that were off-limits. The result is truly the alchemy of a polished decorator. Hats off to James for hitting it out of the park. I supposed he has seen a home or two in his day. . . .
All interiors photos are via Architectural Digest and taken by Stephen Kent Johnson and styled by Miranda Brooks.